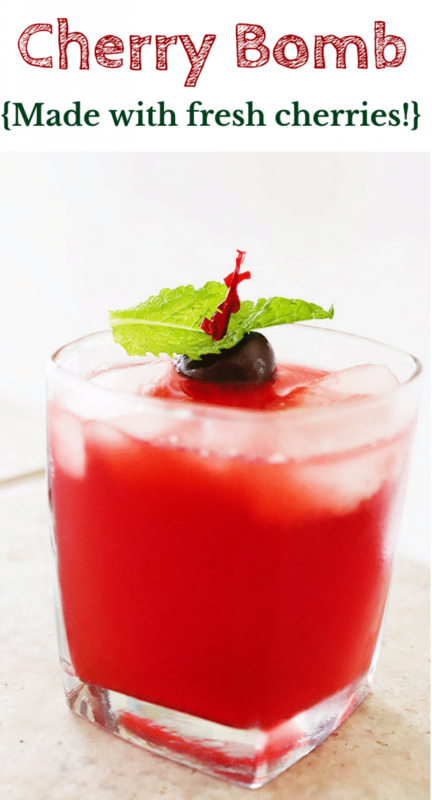 This Cherry Bomb Drink brings together fresh muddled cherries, lemons, limes, and mint leaves. Combined with a dark rum and Angostura bitters, it’s a sweet, punchy drink that tastes like summer! Last week, my CSA included a pound of organic bing cherries, which is why July is one of my favorite months! You can buy fresh cherries for around $3 a bag, as opposed to $10 when they’re not in season. If you’re looking for a fresh tasting and vibrant cocktail, you will love this cherry bomb drink! 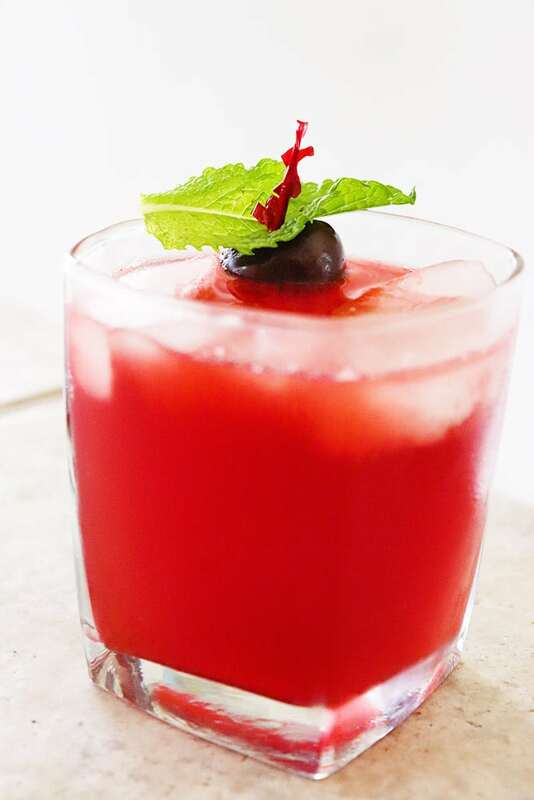 To make this summer cocktail, you start by adding cherries that have been cut in half and pitted, with the steps removed. Add the lemon, lime, and mint leaves. If you have a muddler, you can use it to muddle the ingredients together. If not, use the end of a wooden spoon to muddle. Strain the liquid into a shaker filled with ice. Add in rum and a dash of Angostura bitters. Shake well to mix and cool, then strain into a glass of ice. Garnish with a fresh cherry and a mint leaf! 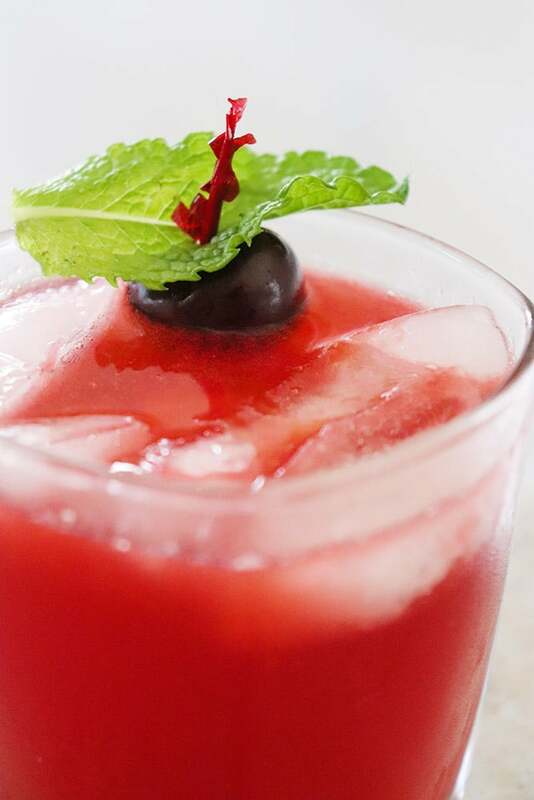 Add cherries, lemon, lime, mint leaves, and simple syrup to a sturdy glass. Use a muddler or the handle of a wooden spoon to muddle the ingredients together. Transfer liquid to a shaker filled with ice. Add in rum and bitters, shaking to combine and cool. Strain into a glass filled with ice and garnish with mint leaves. Save this recipe to your favorite cocktail Pinterest board, so you can come back to it anytime you’re craving a cherry bomb! Just click on the image below to save it. Love fresh cherry cocktails? Here are some more to try!